I am not a notable tree hugging greenie. I am not the one leading the fight for global correctness. But I do care. When I have a practical opportunity to care, I am gonna jump right in. In November 2016 I get the opportunity to jump right in. AGL have a great idea. They may not have the only great idea. They have the idea that captured me. My twitter feed runs all day long in a corner of my screen. On August 5 I saw an announcement from AGL about this virtual power plant. This is a link to the press release. I had recently installed AGL solar panels on my roof and was feeling eco self righteous. I liked what was on offer. AGL offered a well priced battery pack as long as I joined a groundbreaking electrical enterprise. So… this is not just a battery pack. I do like the idea of moving some sunshine into my evenings. I know I make about 30kWh of power per day. In 20 days of November I have generated over 650kWh of power. And I have used less than 450kWh. But I am still paying for power. I cant get that daytime power into my nighttime living. Batteries will let me drag some of that sunshine into the evening. That is what I get and I will be happy. AGL have want to lay batteries all across Adelaide. Perhaps as many as 1000 of them. In summer, we all turn on our Air Con at 5.30 of an evening. Often the grid can't cope. AGL can draw on that stored power to assist the entire city. This sounds like a wonderful plan to me. Kind of crowd sourced energy. I am a fan of crowd sourcing. I like the idea of Waze, the community based traffic map. And I am a big fan of Flight Radar 24 where aircraft fans can share what their equipment shows is in the air all across the planet. Now I can share a bit of the sunshine that falls on my roof with the rest of this city. We have so much sunshine in Adelaide. It all slips off the end the of the Glenelg jetty and over the horizon to Perth and Mozambique. Such a waste. If we can keep 1000 batteries of sunshine here, I am all in. I am quite proud to be the first to join this virtual power plant. Twitter has justified its existence for me. My batteries arrive this week. I wanna share my excitement. This is an innovative plan and I will continue to write about it over the next little while as I get used to what it offers. I am not too worried about AGL using all my stored power but soon we will know. I hope you find it interesting. Happy to respond to any questions and comments I manage to see. We should know by now from watching air crash investigations that an airline incident is a product of many failures at once. I am pretty sure that a single breakdown does not cause hundreds of people to fall into the ocean. I am also pretty sure from my readings of Aviation Herald that dozens of incidents happen every day. Few result in anything beyond a sensationalist headline and a few lines on twitter. So yesterday September 20 2013 an incident occurred almost directly over my head. About 38,000 feet over my head actually. That is about eleven and a half kilometers - up! I saw it happen not in the air but on Twitter a short while later. You have probably seen the headlines that 2 Qantas planes almost crashed over Adelaide. I'd like to tell you how I followed up what had happened and the tools I used to discover the truth. I despair of journalism. Not all journalists but certainly many I stumble over in the popular press. I understand I am personally to blame for the entire failure of the fourth estate. I stopped buying newspapers. This has its implications. I do recall being excited to collect a free copy of the Sunday Mail from my local supermarket recently. I have stockpiled it. How else can I clean the bar-b-que. I have yet to see a publication on line that I am ready to pay for. I do look at the on line press daily and shake my head at the trite rubbish that pervades the popular press. Nothing could convince me to pay for what I have seen so far in the areas I am keen to know more about. So it is all my fault - I apologise. Then I read a piece like I saw recently and I know I am right. The standard of journalism is simply abysmal. I will not link to the story but if you follow the popular press you will no doubt stumble over it. TalkTechnology held its first seminar early this month. 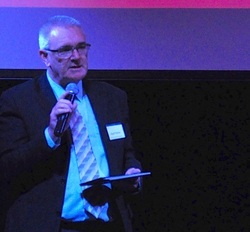 I was pleased to have been invited to host the evening and introduce the guests. It was a great night. There were teething difficulties mostly around staging and microphones. The projector had certainly seen better days. All of those things are easily remedied. The core stuff, the speakers, the content, the concept… all good. TalkTechnology has a strong philosophical basis as outlined by Tania. It is important that we know who is behind Talk Technology so we are transparent about where the funds go and to be sure there is no conflict of interest between the organisation and the presentations. TalkTechnology has a social conscience and donates profits to an organisation that strives to make the world a better place and uses technology to deliver that message. A team made up of Education, Business and Industry representatives builds the program and ensures that the needs of all sectors are covered in a fun learning environment to ensure the best possible outcomes. Education delegates all receive a certificate for their continuing professional development. 15 minutes later Tania took the stage to welcome the crowd. She explained the theory behind TalkTechnology and introduced me as the host for the evening. 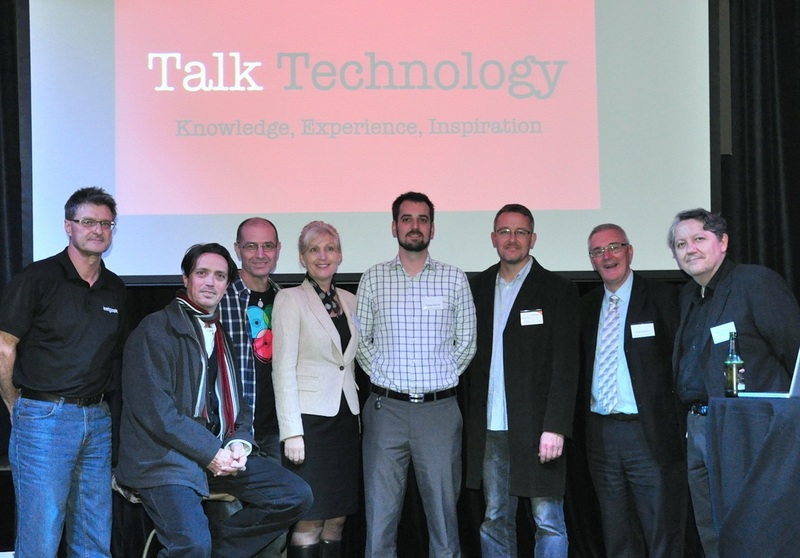 I explained the format behind TalkTechnology: a major topic, in June we focussed on Mobility; addressed in 3 strand: personal, professional and industry. I introduced our twitter hash tag - #TTJune and invited all our guests to take notes and to post the key points to twitter using this #. After the event we can relive the event through the hash tag. Our first speaker was Gawain Duncan. You can see his CV at about.me/gawain_duncan. The success of the programs require three things - The Cloud, A Mobile Device and Willingness. Never forget willingness. Gawain works for the Department of Education and Child Development - these projects surely show the commitment to child development. Gawain’s bio concludes with “What a great time to be in education” His presentation shows why it is a great time. Tristan Haines was the next speaker: about.me/tristan.haines. Tristan is a fringe technology specialist. He speaks from the industry point of view and introduced us to why the cloud is so important. He showed a wonderful analogy of cloud services being like electricity distribution during the industrial revolution. It makes sense. Back then every factory needed its own power source. Today power is centralised. Now we all want our own storage. Cloud means we can move to centralised storage. We enjoyed Tristan’s view of the fringe, as the fringe encroaches on us day by day. We had a special guest to this meeting. Alister Cameron works with World Vision and came to tell us how World Vision is meeting its goals in developing countries using mobile technology. Our Twitter feed showed delegates recognising what World Vision is doing towards a better world exactly like Tania wanted as she designed Talk Technology. Our Final speaker for the evening was Viano Jaksa, about.me/viano_jaksa who addressed mobility from a personal perspective. Viano’s trip back in time entertained us all. His perspective on mobility for us in our work life as well as our personal life was a delight as shown through the twitter comments. It was a good evening. I closed with words about the future of TalkTechnology. I mentioned that the certificates would be emailed to all teachers in the audience with reference to the Teacher Professional Standards. Tania finished the evening with a few thank yous and an invitation to look out for the next Talk Technology later in the year. Talk Technology number 1 was a big success. All involved enjoyed drawing it together. We look forward to the next topic for discussion in September. Have been concentrating on my other selves for the past few months so been a while since I posted here. Please do check out my other selves, my music self and my professional self. Today I want to write a more general post on social media. My good mate Viano just showed me a site called about.me. It is a place to store your Bio and I am quite taken with it. I am often asked to supply a Bio for a speaking gig and just hate it. I cant find the last one, then I don't like it and have to rewrite it... never comfortable with it. So when I was asked recently for one, Viano suggested to write it once into about.me. I will keep developing it more yet and link it to other sites I maintain. Yes my digital footprint is growing. I was amazed with the views that about me is getting. According to statistics I received over 100 hits in the 24 hours since I discovered it. I suspect about.me may be attractive to social media junkies but it meets a need for me right now. I did follow links to people who had linked to me over the last 24 hours. One of the visitors was very keen to make connections in all ways possible. A quick look at that profile showed me 73 different ways to connect to him. I can't conceive of maintaining 73 friends social media sites. I cant cope with just Linked in, Twitter and Facebook as well as this blog and 2 other sites, but 73... that is a full time job. Well no... that is a stamp album. I have always been amazed at the stamp album mentality that IT can provoke. I recall my days in the 80s playing with Commodore Amigas. I remember turning up to a user group meeting and seeing the guys who arrived with shoe boxes of disks by the hundreds of all the programs they had. They never used any of them, but they had them. It was a stamp album. Perhaps being connected digitally is the new stamp album. I know teens often measure themselves in the number of Facebook friends they have. Then again, maybe this kind of blogging is just my attempt to get a bigger stamp collection too.